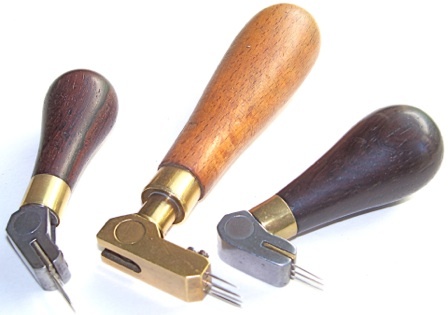 Voicing tools before World War II were made in petite sizes, compared to many made in the last 30 years. The hammer felt used then was pliant and relatively easy to work with needles. Large voicing tools, which provided a large grip necessary for some hard pressed hammers, were not needed then; a different approach was used. 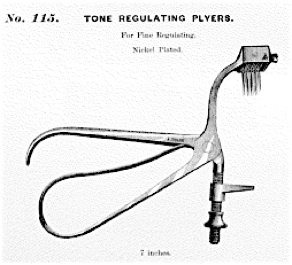 Sievers voicing tool, a type in use during the early 19th century. Illustration from Il Pianoforte; Guida Pratica by Giacomo Ferdinando Sievers, published 1868 by Ghio, Napoli. 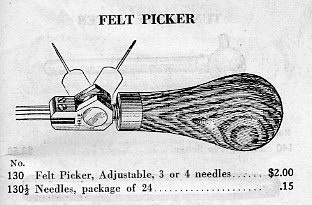 Two choices in a “felt picker” were available to the tuner shopping at Hammacher Schlemmer in 1885. The one on the right was called a French felt picker, as this flat handle design was popular in Europe, and is still available today. 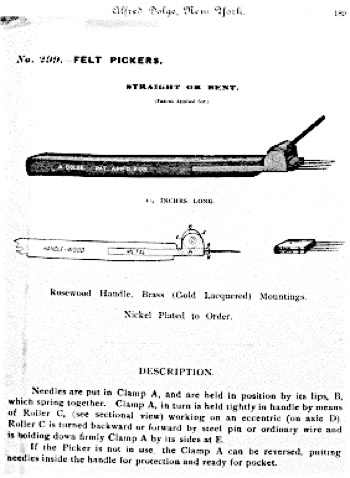 Note that the full length of the clamped needles are shown in some of the catalog illustrations. Voicing tools are never used with the full length, they would easily break off this way, even in the lightest practical use. 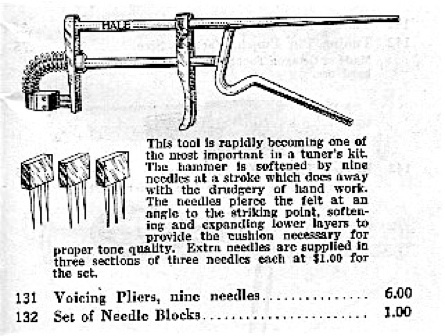 The voicing tools shown on this page are shown with all needles installed, but cut down to an appropriate length, for display purposes only. Fewer needles are actually used in many situations on hammerheads, sometimes only one needle. All of these voicing tools with one large set screw work best when all of the needles are the same size. 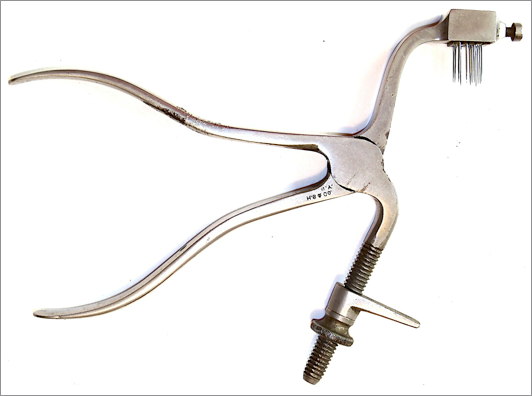 If slightly different size needles are used, careful shimming within the clamp must be done. 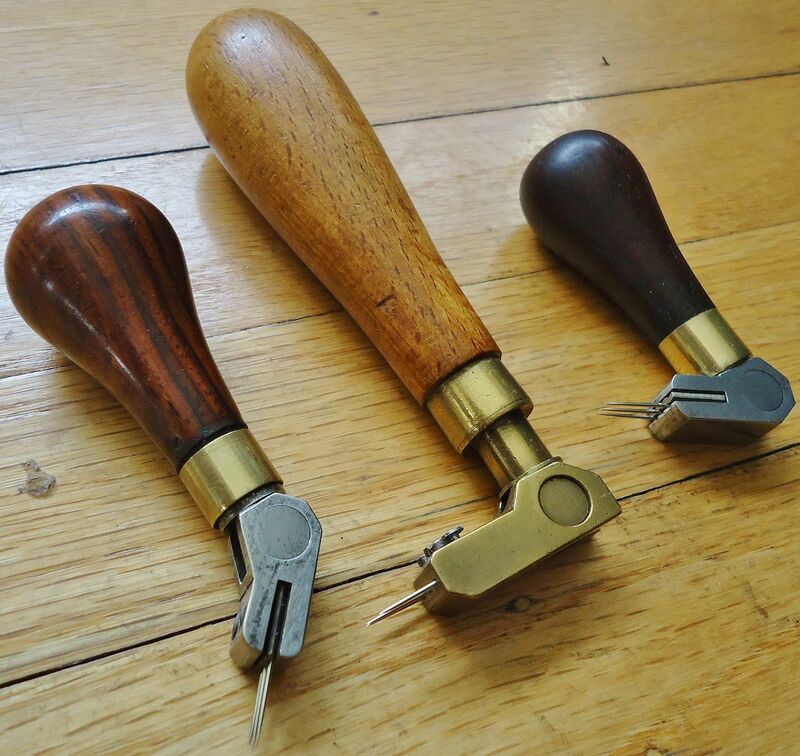 Three tools made in this ‘French’ style. 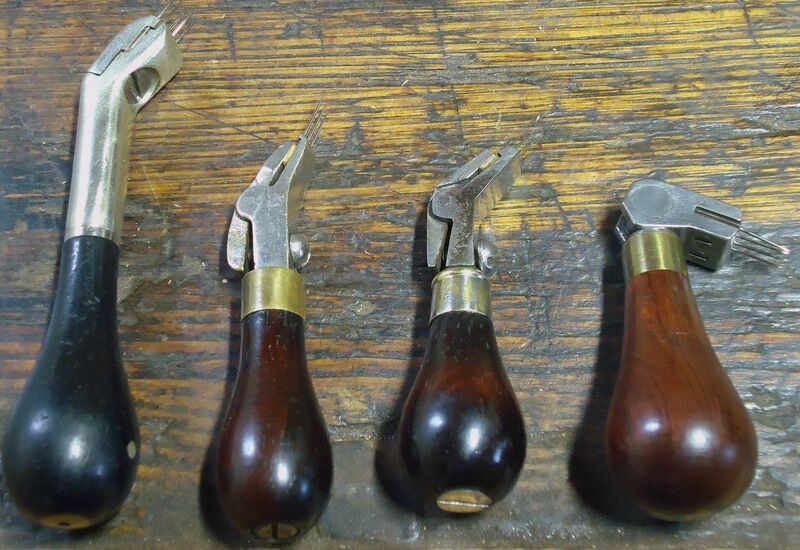 These examples all have a downward curve on the business end, to give more ready access to the hammer head, The one on the top is a German-made tool, a Renner type, from the mid-20th century, and is one of the least old tools in this presentation. 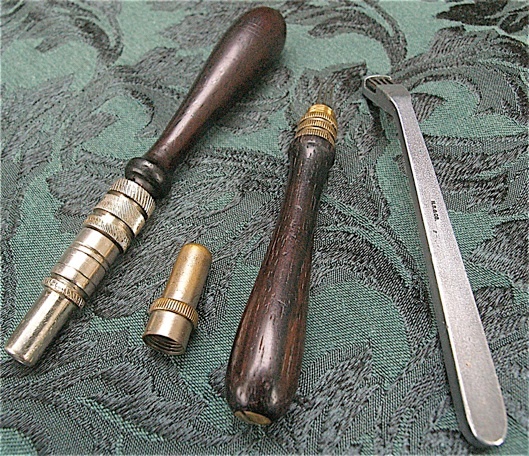 The rosewood, bronze, and brass voicer in the middle, c. 1900, has five needles, but only three set screws. The dark rosewood, steel, and brass tool in the foreground is worn so smooth that I think it probably has been used in a production environment. This felt picker came with a protective shield so that it could be carried in a pocket without injury. 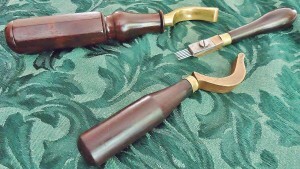 Two voicing tools similar to above, the top one was sold by Hammacher Schlemmer. Voicing tool from J.D. Weickert in Leipzig, Germany included in a batch of tools from the 1880s. Weickert felt is made today by the Wurzen Felt GmbH. The piano is an old 7’4″ Grotrian that I restored in the late 1990s. 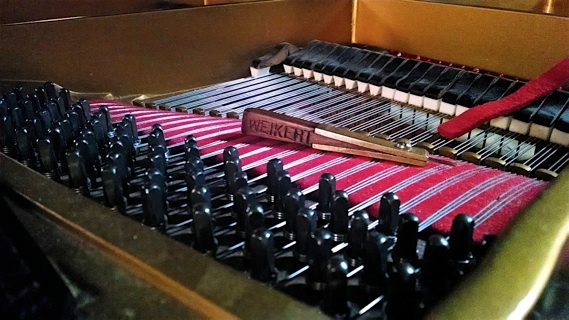 Weickert voicing tool, download version. The handle is actually mahogany. Three unusual voicing tools. The voicing tool at the top is curved, and has a shape much like the adjustable models which came later. This tool has ebony infill surrounded by bronze. The “French style” voicer, middle, is made from pretty laminations of ivory and ebony. The bronze and rosewood McIntosh felt picker has 10 needles, tools with multiple needles like this (but not as many) have sometimes been called “sugar coaters” for very shallow needling in the crown area of the hammer. This particular tool is wide enough to treat two hammers at once. Another view of the curved voicer, showing the screw holding a storage compartment for extra needles. The ebony infill surrounded by gunmetal reminds me of infill planes. Its possible that this was made by one of the New York City instrument plane makers. Smaller version of curved design. Erlandsen was the most likely maker of both. 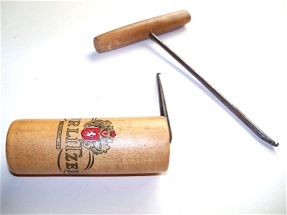 This voicing tool has details similar to Hale hammers before WWI, with German silver hardware and a German silver pin running through the handle, The handle is shaped similarly to the Hale adjustable voicing tool models which followed. 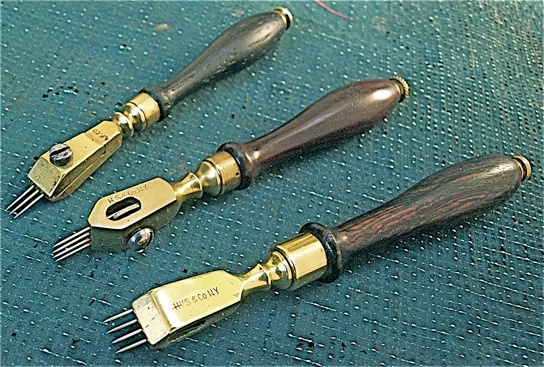 Three English voicing tools, all with six needles. 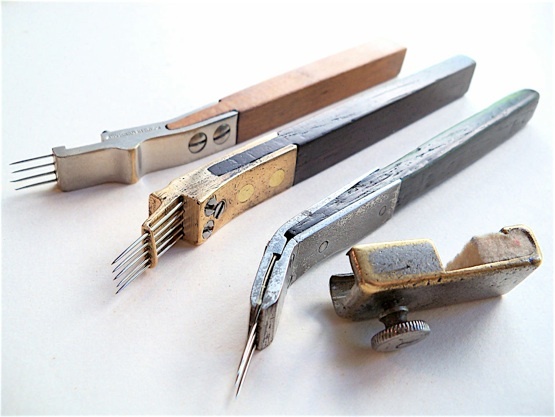 In England, these tools were called toning needles. George Buck at 242 Tottenham Court Road in London sold the one in the foreground. Other two are unmarked. On the left is a beech-handled voicer shaped like a Shaker peg. Buck toning needle. Another example of a Buck voicing tool. In the download version of this image you can see where another name was filed off–most likely R. Reynolds. J.& J. Goddard piano Ironmongers; 68 Tottenham Court Road, London. All brass voicing tool with needle storage in handle. And flat style with sharp curve. 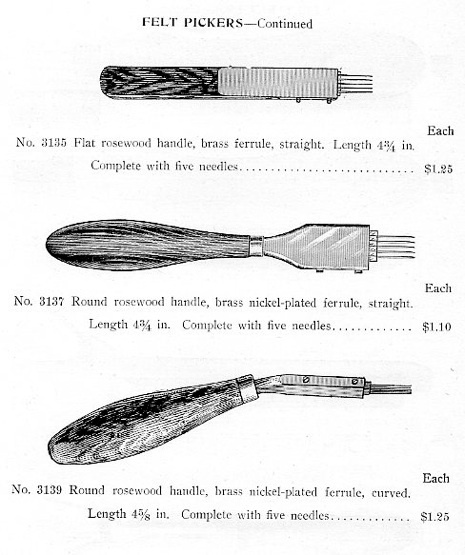 The 1911 American Felt Company catalog included three pages of voicing tools. This increase of choices in voicing tools, as compared to only two in the 1885 H. S. catalog, is typical of the product offerings in the industry across the board during this time period. A. Dolge, 1892. The American Felt Co. assumed the Dolge supply house c. 1900, and excerpts from the 1900 A. F. catalogue are included in this website. Irvington, New Jersey Manufacturing Co. I don’t believe they made a lot of piano tools; linesmen’s pliers remain the most extant tools from this company. Voicing tool with eccentric roller, Alfred Dolge, 1892. Below, two simple felt pickers. The tool at the top is a nicely shaped piece of maple with small holes carefully drilled into it to insert the needles. The tool below it is a homemade affair with two pieces of rosewood glued up with four needles sandwiched in between. When I found this in a very old tuner’s bag, I was reminded of the passage below this photo, which is an excerpt from Edward Quincy Norton’s The Construction, Tuning and Care of the Pianoforte published in 1887. 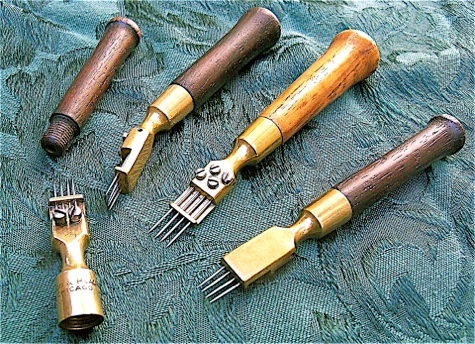 Four voicing tools from the 1920s and ’30s. These have handles which are screwed into the ferrule, and inside, the handle is drilled out to provide storage for extra needles. The voicer on the right is straight, the others have a bent or curved needle holder. The smaller Lyon and Healy voicing tool is taken apart and you can just barely see the handle drilled out for storing additional needles. It’s actually a C. H. Lang design and was included in the 1899 poster illustrating his tools. The Lyon and Healy has only two set screws compared to the Hale design which has four. Hale derived his design for this type of voicer from Lang. Each handle has a slightly different shape. Original Lang voicing tool, top, and Lyon & Healy copy below. 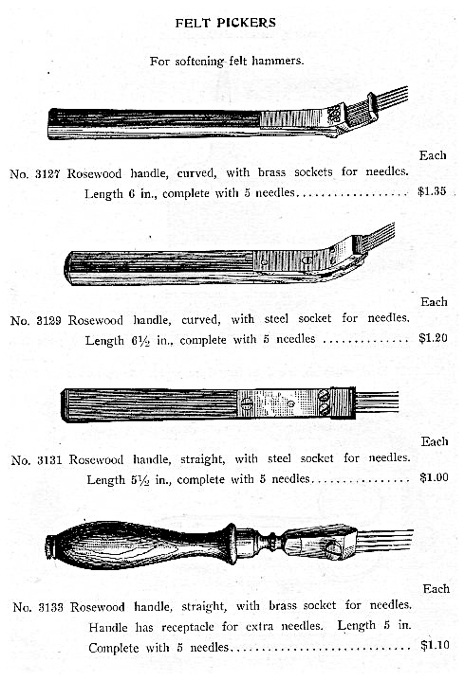 Here is a similar tool listed in the Hale 1935 catalog. The 4 individual set screws allow for using slightly different size needles at the same time. With the Lang voicing tool, its best to use the 2 same size needles under each set screw. 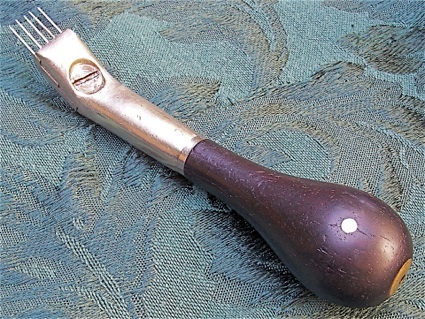 Adjustable swivel head voicing tools, a Hale development, became popular in the 1920s and ’30s, although they were offered in the catalogs at least as early as 1916. This feature enables easier access to upright piano hammer heads, when the needle holder is adjusted to the downward positions. 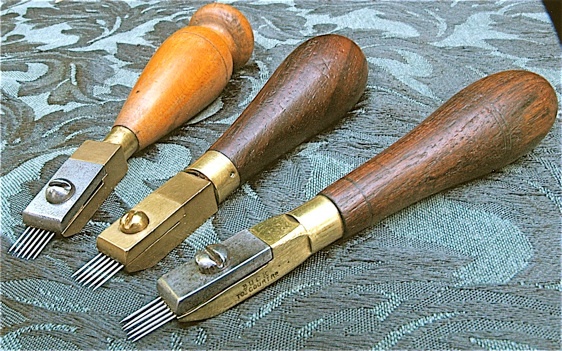 In the following picture, the two examples on the left and right are Hale tools, and the one in the middle, with a beech handle, is unmarked. Adjustable voicing tools, download version. 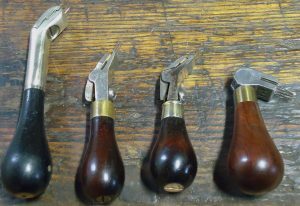 Evolution of the Hale (Tuners Supply) voicing tool towards a swivel head. Left: 1880s to ~1905, German silver hardware, angled profile, expensive to produce. Middle two: fixed angled profile, use of a lever cap, not unlike a plane. Somewhat tedious to set up. Circa 1905-1910. Right: adjustable swivel head, introduced circa 1916. 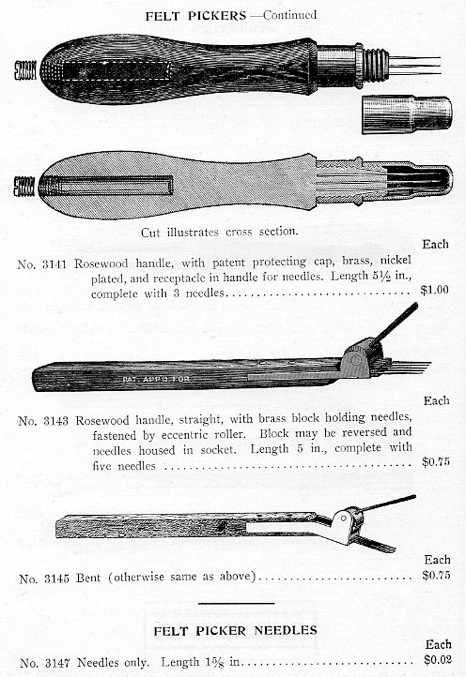 Here is a similar tool listed in the Hale 1935 catalog. Sandpaper file (top). For reshaping hammer heads. 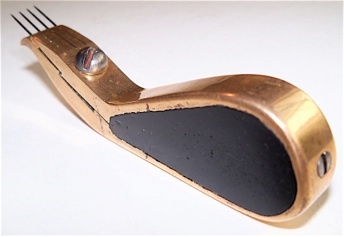 Hammer iron, bronze with leather bushing (bottom). Sometimes used for steaming. Two older hammer irons, one brass, the other bronze. 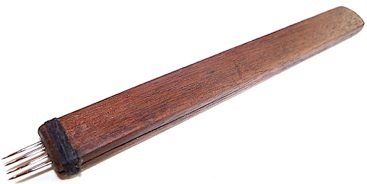 With rosewood handles, and a Buck toning needle, likely made by Reynolds. String hooks for leveling strings, etc. I do not know if this tool in the foreground is actually from the post war Wurlitzer factory. H. S. string hook, c. 1905. 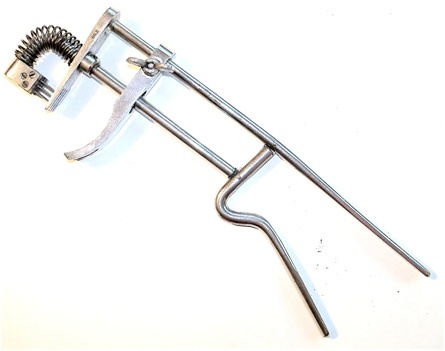 John Ford made a copy of this tool in the 1970s and 1980s, and it became my favorite design for a string hook. 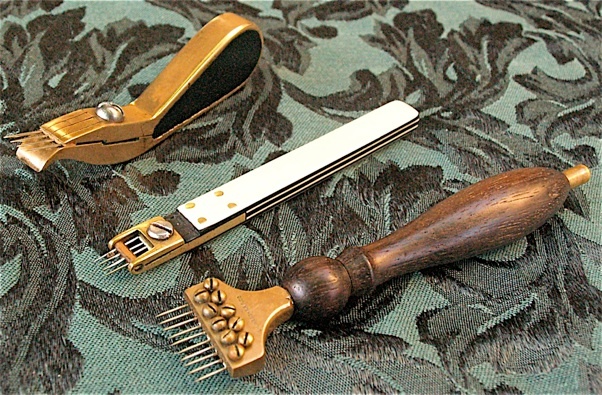 John Ford, who ran a piano supply house in New York City from the 1960s to the early ‘90s, made a study of the old piano tools when preparing to offer his own modern versions of them, For example, he reintroduced the storage compartment for needles in the voicing tools that he produced, which had not previously been done in the U.S. for many years. A useful detail. Although I find these voicing pliers interesting, I don’t necessarily condone their use! Incidentally, Jahn and Co., a piano supplier in Germany, makes a a modern version of the voicing pliers. 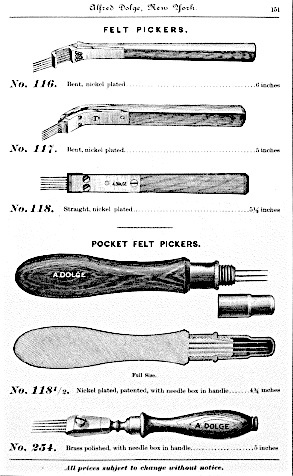 The earliest piano-hammer voicing pliers that I found was in the 1892 Alfred Dolge Co. catalog. Its configuration was like the Hammacher Schlemmer example shown here. From Richard Hornung estate, 1990. Here is an early patent for hammer voicing pliers. 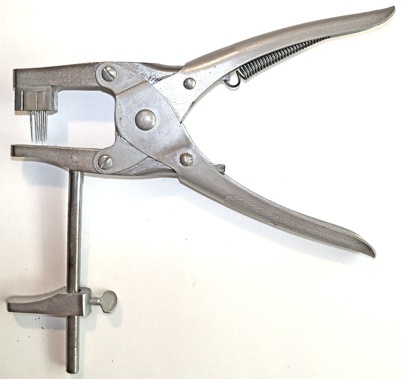 Hale voicing pliers, shown below, have this same basic design. Franklin Hoover has two other patents in this website: the piano action screw holder on the Misc. page, and the hammer extracting pliers, on the Piano Pliers page. 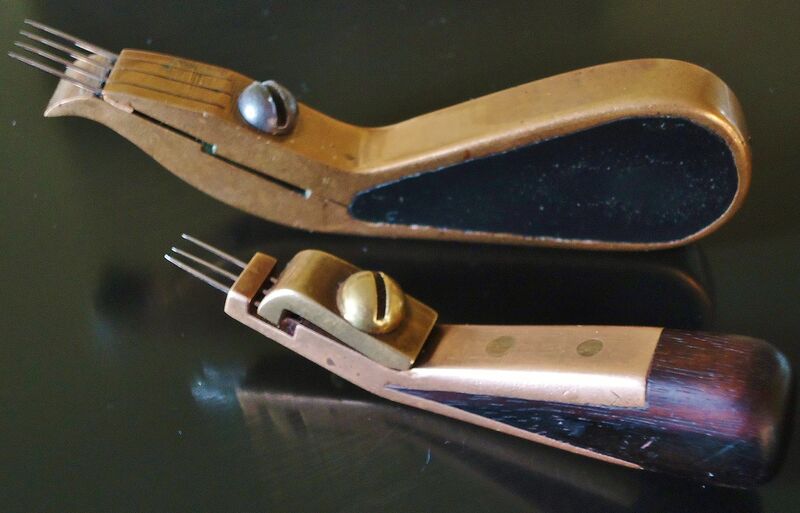 The Hale voicing pliers from the 1920s and ‘30s. Hale voicing pliers from the 1950s and later. It looks more like an instrument of torture rather than a piano tool. This came inside the workbench I received from my old business partner.